I imagine the pre order for the two pack will be going up soon. 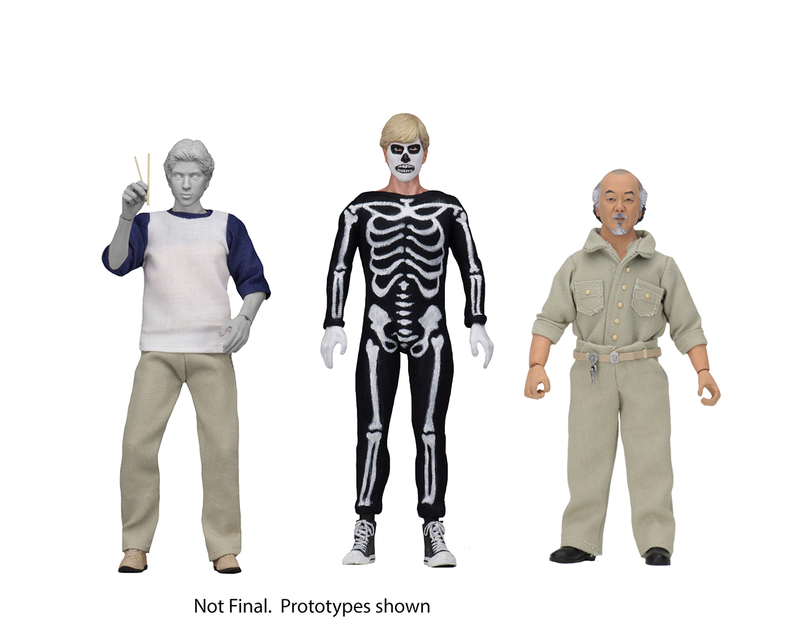 Also, I seriously hope they make Cobra Kai figures. Those are terrible likenesses. Hope the final product looks better. I want to have the real hero of the movie, johhny, standing on my desk. Last edited by Nitelife; 01-28-2019 at 08:30 AM.. The likenesses are okay. But I've been waiting far too long for updated Karate Kid figures to pass these up. I like how they have Daniel-San’s screen accurate defensive hands. Something about their faces reminds me of Beavis and Butthead when facing forward. The figures look terrible. If you're a fan of the movie then obviously you'll get who they are, but if not then not sure you could place it. I hate when NECA does the 8" MEGO style figures for a toy line instead of the 6" plastic versions that scale with most other lines. It's why I never got their Snake Plissken or POTA Taylor figures. 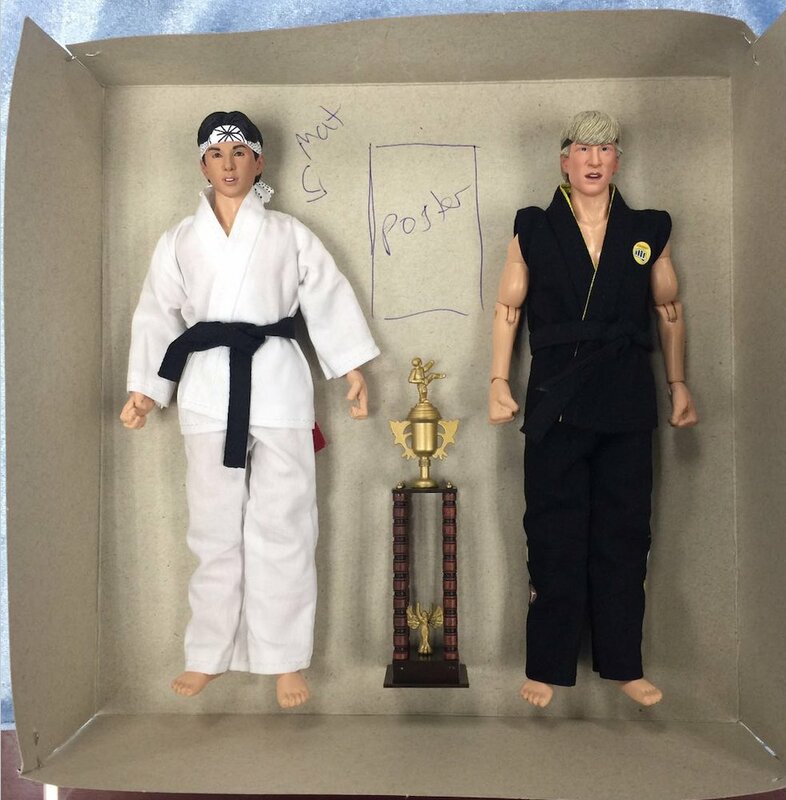 Back at SDCC last year, another company called Icon Heroes had this displayed in their booth, indicating they were doing their own Karate Kid line and that it would be in the 6" plastic scale that many fans prefer. Has anybody seen any updates on that? The card says "4th quarter 2019", which is still far away. I hope they are still in the works and that we might see prototypes on display at Toy Fair next month. I'll definitely wait and get these instead of NECA's dumb MEGO figures. Last edited by ShabbyBlue; 01-28-2019 at 10:43 AM..
good idea, bad execution. i dont like mego style figures. maybe a one piece fabric on a fig but thats it. if they made this non-mego style then ill buy it for sure. Comments like this drive me crazy! There are fans of the retro line, you need to accept that. Bashing it because you don’t like it means nothing, it’s just annoying at this point. The POTA and Escape from NY were really good figures! Even a non collector of the retro line will tell you that. They’re cheaper to make for NECA, and some licenses don’t sell as well as others. So it’s either this, or nothing else. Sometimes the money from these will lead to ultimate versions. Also, don’t try and adjust the focus to a different brand, and call NECA’s figures dumb. That’s ridiculous! I’m not an admin here, but I would definitely boot that comment. I mean, if you don’t like the figures, that’s understandable, but stay on subject. It is on subject since nearly every comment in this thread is saying how awful these figures look. I was pointing out that there's an alternative Karate Kid line potentially coming later this year and asking if there had been any news update on that line, since I'm holding out for it instead of NECA's line. My opinion of the MEGO figures is just an opinion. You don't have to like it, and trying to delete my comments just because you disagree with them is a pretty harsh censorship. This is a toy discussion forum and everyone should be able to freely criticize toy lines. Last edited by ShabbyBlue; 01-28-2019 at 12:28 PM..
Wow, first NECA tanks on the Ace Ventura likeness and now this. Daniel and Johnny look nothing like their respective actors. The headsculpts on the other Daniel and Johnny looked good. And Im assuming these figures are using retooled versions of those head sculpts so wonder where it went wrong. And I believe those other figures are going to be Icon Heroes first attempt at articulated action figures, so that should be interesting to see. Icon Heroes previously did Once Upon A Time 6" Figures. They were ok, more in line with Funko Legacy than higher end 6" figures. Weren’t those figures delayed for a long time, then released out of nowhere? I think the issue that everyone is complaining about isn't the sculpt but the final paint job. If you look up the artist who did the sculpt they appear to be on point. It's only after the paint is applied that they seem to lose their likeness. Their were long times between releases if I remember correctly, but I didn't follow the line too closely. The skeleton john seems to be better sculpted than final battle john.....who is still the hero of the story to me. i missed out on taylor and snake but i do want john.